Bethlehem, occupied West Bank - Posters emblazoned with youthful faces dot the walls that line Aida refugee camp's narrow, grey alleyways: faces of camp residents killed by Israeli forces. Nights here can be long and terrifying. Israeli soldiers use the cover of darkness to launch raids, fire tear gas and arrest camp youth for throwing stones or being affiliated with Palestinian political parties. For the children of Aida, it is a grim way to grow up. Israel's separation wall hems the camp in on one side, while Israeli snipers watch over the crowded homes from heavily guarded watchtowers. Tombstones inside the camp's graveyard show the ages - 17, 19, 20, 21 - of Palestinians killed in recent years. But in one of the camp's schools, a local organisation is trying to bring back a semblance of childhood. Sounds of Palestine, a group composed of local musicians and social workers, is teaching children between the ages of five and nine how to play musical instruments such as the clarinet, cello and violin. The organisation, which was launched in 2012, is aiming to expand into isolated areas of the West Bank and has been providing extra activities for children amid the recent wave of violence in the region. "All of these children are coming from very hard backgrounds. Every day, there is shooting and tear gas," programme manager Ahmad al-Azzeh told Al Jazeera. "What we are doing here is creating a peaceful and safe place for them, while also giving them one of the most fantastic tools available to people, which is music. Music can make anyone happy." As he speaks, the din of three clarinets being played enthusiastically fills the school's corridor. 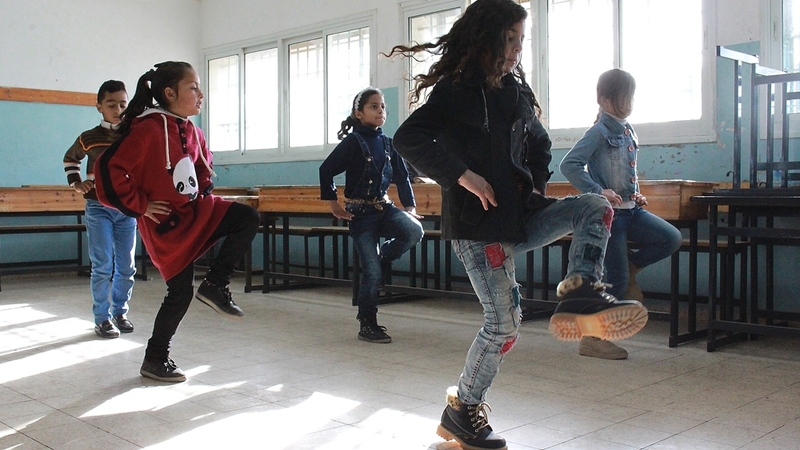 Inside the classrooms, children participate in drumming lessons, strings lessons, music theory classes and a class focused on Dabka, a lively, traditional Palestinian dance. "I love playing the cello," Yara Karkouf told Al Jazeera, smiling, before she rushed off to her Dabka class. "They teach us how to play. I'm excited being here, and excited when I go home to tell my mother what I did and how well I played." "These children have seen their relatives shot, their family members taken to prison; all of the violence here, they are a witness to," Azzeh said, noting the violence has increased in recent months. "They are traumatised, and if I'm honest, the adults here are traumatised as well - but at least we know how to handle the trauma. The children don't. "In another room, a mini-orchestra plays Frere Jacques with gusto. They appear immersed in the music, free for the moment from the troubled realities of their poverty-stricken camp. For every music teacher at Sounds of Palestine, there is also a social worker available to speak with students and counsel them, he added. Indeed, the escalation in violence in Israel and the occupied Palestinian territories in recent months has seen increasing Israeli incursions into Aida. Clashes between stone-throwing youth and armed Israeli soldiers are commonplace, while young children have been arrested by soldiers and taken from their homes in the middle of the night. The circumstances have taken a significant psychological toll on the camp's children. Today, camp resident Ahmad Saqer, who is eight years old, concentrates hard as he studies music theory. He prefers playing the violin, he says, but he understands the importance of learning theory in order to progress. A few months ago, this level of focus would have been next to impossible for Saqer. Late last year, one of his cousins was shot during clashes between Palestinians and Israeli forces, and shortly afterwards, the Israelis arrested Saqer in his home and interrogated him for hours at an army base. Upon his release, Saqer became withdrawn, rarely talking or smiling. He had difficulty concentrating on anything and often covered his face with his hands or clothing, shielding his eyes from the world. Sounds of Palestine has offered him a safe space where he can obtain a sense of achievement and progress, he said. "I'm really good at it," he says of his violin practice. "Here, it feels different; it is not like Aida camp. There is a lot of violence in the camp, but here it feels safe. I feel happy when I'm playing the violin, and my mother has seen me play before. I felt so happy when she saw me." Despite launching less than four years ago, Sounds of Palestine has already seen two of its students win first place in Jerusalem's Magnificent Strings Competition, an annual forum for the best young strings musicians from Jerusalem and the occupied West Bank. Azzeh says the organisation aims to continue providing music lessons to the children as they get older. Every year, they have extended the age range by one year, bringing in new children while continuing to teach their existing students. Funding presents a challenge, Azzeh admitted, as the organisation runs on donations from private donors and organisations. As more children sign up, it has been difficult to obtain enough instruments, but Sounds of Palestine is determined to forge on and expand in the years ahead. "The dream is to one day have a Sounds of Palestine music school in its own building, giving away free music lessons and therapy to every child that needs it," Azzeh said.